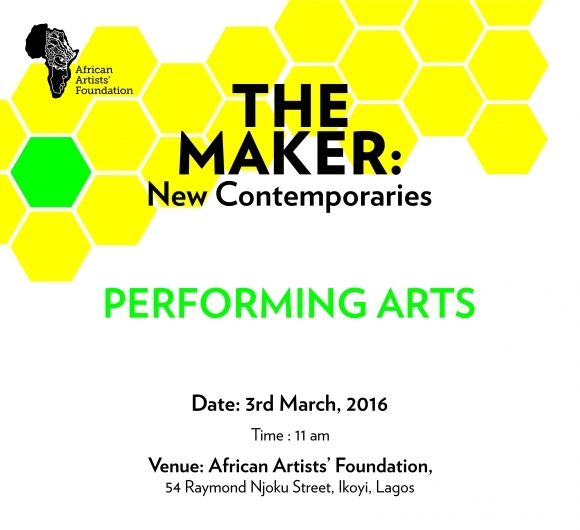 The African Artists’ Foundation (AAF) would like to invite you to the 2016 edition of The Maker: New Contemporaries. This edition which is scheduled to hold on Thursday, 3rd March, 2016 at the African Artists' Foundation, No 54, Raymond Njoku Street, Ikoyi, Lagos by 11am will focus on sub-genres of Performing Art: Performance art, Spoken word, Dance, Music and how arts interact with public spaces. The Maker: New Contemporaries is a platform for emerging artists to have their works presented to a diverse audience of professionals, curators, critics, patrons and the press. This platform seeks to engage an emerging generation of designers and artists at the beginning and early stages of their careers with the aim of giving them the direction and network to expand their practices. The New Contemporaries to watch out for are: Stacey Okaparavero, Folami Razaq, Bolatito Aderemi-Ibitola and Yadichinma Ukoha-Kalu.